Featured quilt of the week! I am very lucky to have many quilting friends who inspire me! Judy Dillree is one talented quilter and best of all I get to call her my friend. She designed this outrageously fun quilt just after my first book (PIECED TO FIT) came out and agreed to let me put it into the second book. It’s included in Perfect Fit Pieced Borders. I had such a fun time quilting it and choosing thread colors. Now I’ve been able to see it done in other color schemes, and different applique techniques, but this one is the masterpiece. Judy you are a gem in my life, I appreciate the many times you’ve let me quilt your quilts, the time we’ve spent together talking and laughing and quilting. It is a treasure to have you as a friend for 3+ decades! Not ready to give up Christmas yet! I was able to work on this quilt in the beginning of December and kick-start that holiday feeling, and I’m enjoying it again now, stretching the holidays out as long as I can! 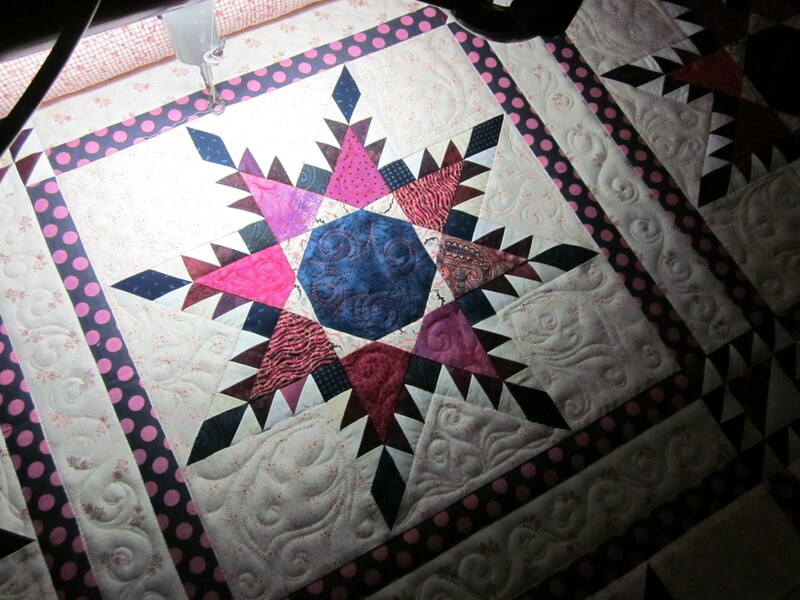 I’ve had the pure pleasure of working on a Feathered Star quilt for a friend. Besides having known each other for about 3 decades, we’ve worked together, and now have quilting in common too! As you can see, the Feathered Star is a masterpiece! Perfectly pieced, and I know this because I was “up close and personal” with it for many hours while I completed the quilting. Another thing that puts this quilt in the masterpiece category is the adventurous use of scrappy fabrics pulled together with the neutral background and a killer focal fabric used for the border, not to mention the polka dot sashing! There are some surprises in there and lots to look at in this quilt. Careful and consistent pressing can’t be seen on the surface but contribute more than you realize to the quality of the finished quilt. My hat’s off to you Carolyn! Congratulations, and may you have many years of that warm quilty feeling with this work of art! Sheila’s New Book Has Arrived! My new book Perfect Fit Pieced Borders has just been released by Martingale & Co. It’s exciting to see the great photography, graphics and clear instructions. You already know from my previous patterns that I like to piece the quilt right out to the edge; that includes the borders! Some designs have traditional looking borders, some have what I call finishing elements that give the quilt a finished look without borders. Be sure to look at the slide show to see the fun designs. It really has been an honor to work with Martingale & Co. to develop this book as they are easy to work with and have allowed me to have so much control. Of course the quilting is very important to me as a longarm quilter, and I was able to include quilting designs for each quilt that also included photography of the quilting so you could get some ideas of how to quilt your version! 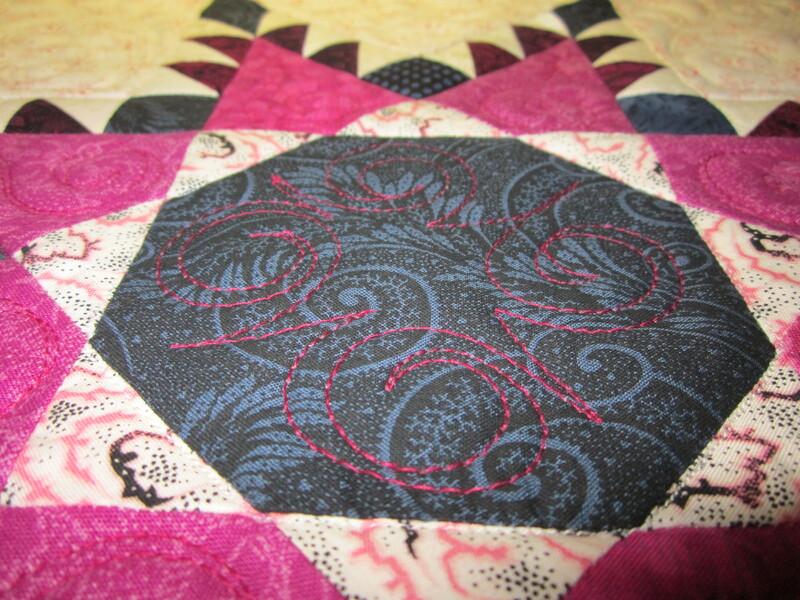 Pieced borders will change the look of a quilt, making it more interesting and exciting by adding a surprising finish. What I love most about quilting is what I call the “layers” of design: choosing the fabrics, cutting the shapes, piecing, creating appliqué designs, sewing everything together, adding borders, quilting, and the final statement of the binding. Each layer relates to the others, and this always teaches me something and keeps me interested. Every step along the way can be fun and creative, and I think traditionally the borders are often overlooked. I always take the time to consider border options. Almost every quilt can benefit from pieced borders; they make a quilt extra special. I hope you love this book and make several of the quilts! For those of you who haven’t met me, or never even heard of me, and for those of you who have, but are still curious, I’m a professional quilter! For me that means I started out as a longarm quilter, learning by the seat of my pants for the first year or so. After that I was lucky to be able to attend my first Machine Quilters Showcase, a longarm convention, and was bowled over, overwhelmed and inspired! 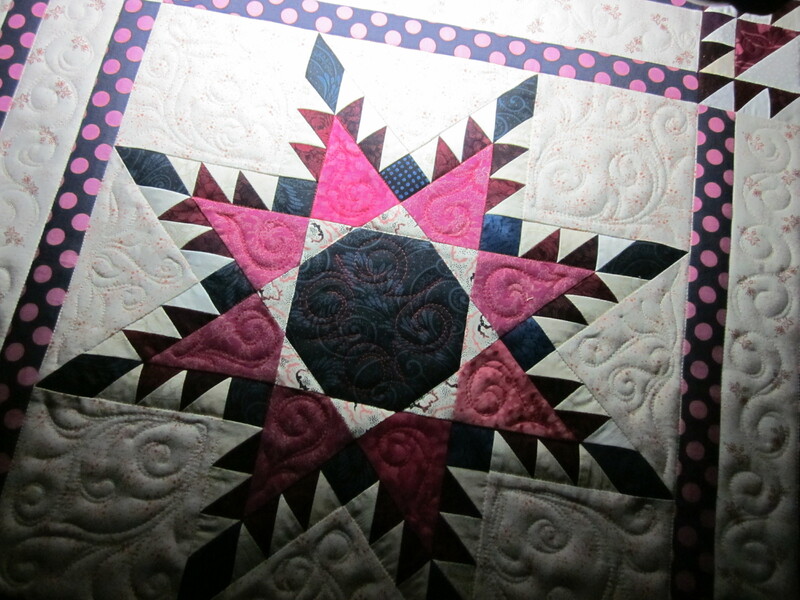 I had seen the light and opened my eyes to the awesome possibilities of longarm quilting. That enlightenment continues to this day, more than ten years later. I’ve been lucky to have quilted about 1800 quilts, taught longarm classes nationally and locally, designed quilts, authored a book (a second book will be ready for Spring Quilt Market 2011), developed a line of quilt patterns, taught piecing and project classes and best of all admired, touched, bought, stashed, stored, sewn and generally loved thousands of yards of fabric! What a life! I’ve been lucky to have met and learned from so many quilters, some famous and some not so famous, but all so interesting and talented, their energy has been inspiring and infectious. I have lots of ideas, and can’t wait for the next inspiration. Since I started out as a longarm quilter, the quilting is very important to me, so just let me warn you, you’ll be hearing a lot more about that! WHO: YOU can quilt like a Rock Star! WHAT if you had a chance to learn some rockin’ and rollin’ new quilting designs? We’ll get together for fun-packed short lessons and hands-on quilting for everybody! Learn some great new designs and skills. Drop in for one lesson, or sign up for the whole series! There might be a glass of wine (or sparkling cider) with your name on it, and some hors d’oeuvres to go along with the laughter and good cheer. 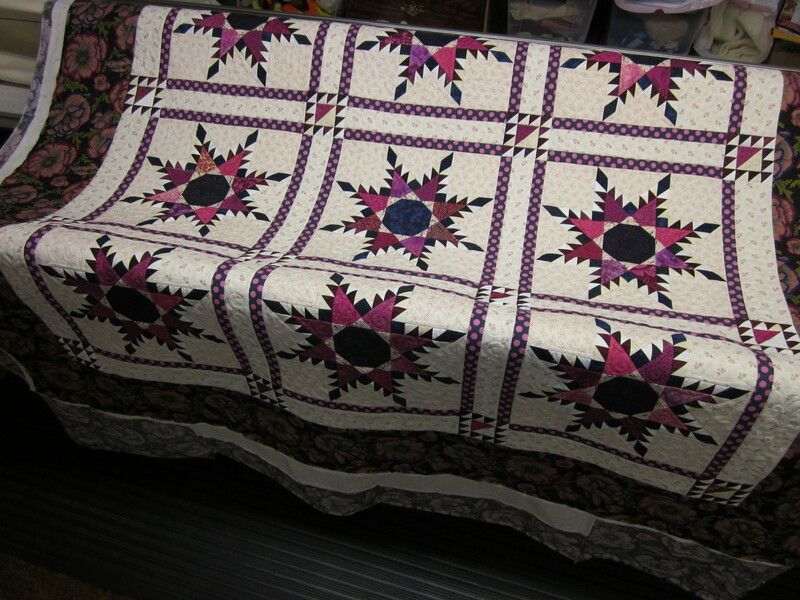 Of course the focus is on freehand artistic quilting, so sign up soon, space is limited. Lesson 3: March 11: Skills and Basics (Make your circles round and your squares square)! Lesson 4: April 8: Micro, Mini and Amazingly Small Designs!